When others offer gifts to welcome a new member of the family it is imperative to send a thank you letter. Not only does such a letter communicate that you value the item that was given, but that you appreciate their generous attitude and interest in marking the occasion. This holds true not only of births and marriages, but of adoptions as well. An adoption gift thank you letter has a dual purpose. Of course you must include a message of thanks for the gift given, as well as how your family or child will make use of the item, but you must also let the recipient know how much their acknowledgement of the adoption has meant to you. For some letter writers this may mean recounting details of their adoption journey, including details of how the recipient helped them through the adoption process and/or acknowledging the role they hope the recipient will play in their family’s future together. If the child who has been adopted is old enough to talk, write or draw then including a contribution from him or her might be appropriate as well. Thank you letters sent to acknowledge adoption gifts are generally personal letters and as such may be formatted as formally or informally as you would like. For the most part it is unnecessary to include details such as the job title and mailing address of the writer and recipient, unless your relationship is strictly business. Including a formal salutation and closing is important and if you choose to type/print a letter then it is a nice touch to sign your name at the end. 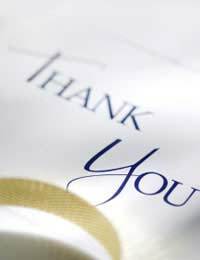 Hand delivery and postal delivery are both acceptable for such thank you letters, and email delivery may be appropriate if most of your communication with the recipient is via an electronic medium. Thank you again for the wonderful gift certificate to People’s Portraits for our first ever professional family photo! We have treasured every photograph you took of us as we navigated the adoption process to find our way to Lily, and of course the pictures you took the day we were able to bring her home are framed all around the house. Even Lily’s nursery is decorated with photographs you took of us together. Now for our first professional portrait to come from you as well feels like the natural extension of your beautiful photography. It means the world to us to have friends like you who are so willing to get involved in our lives and were supportive throughout our entire adoption process. You were always there when we needed help or advice, and that you were able to be with us through so many milestones including Lily’s first steps in her new home, is something we will never forget. You may feel you were just being good friends, but we wanted you to know that we consider you family and know that you are both exceptional people. To that end, when Lily begins to talk I’m sure she will be asking for Uncle Jonathan and Aunt Louise first! Thank you again for your very generous gift, as well as all the time, attention and love you have shown our family. If you'd like to look at more 'thank you for the gift' type letters, have a browse through thank you letters for a baby shower, the christening gift and help with the new baby.